Who killed bourgeois democracy in Europe? When a system calls itself democracy, but forces increasing parts of the demos (people) to live under poverty, its own central concept gradually becomes hollow. 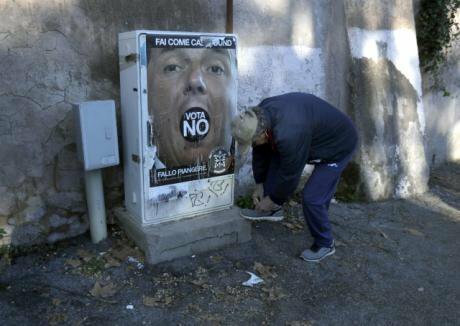 A man stops to tie his shoelace by an electrical booth where an anti-referendum poster showing Italian Premier Matteo Renzi is stuck, in Rome, Monday, Dec. 5, 2016. PAimages/Gregorio Borgia. All rights reserved. Since early December 2016, following the Italian referendum that cancelled Renzi’s government, most newspapers and news-sites have expressed fears about the populist and anti-EU comedian Beppe Grillo and his Five Star Movement winning the next elections in Italy. Simultaneously, the same progressive media seem pretty happy about the Austrian elections that took place that same weekend. In that case the victory against a right-wing populist, with neo-Nazi tendencies, was celebrated. What is striking is that even left-leaning news sources expressed their relief at what was in fact the victory of a highly neoliberal political agenda. There are two basic problems, however, with this entire pattern of response. One, it is in principle antidemocratic. At least given the predominant definition of democracy that was promoted after the collapse of socialist states in Europe. Namely, in representative bourgeois democracy the voting majority will establish via key decision-making events (elections, referendums) their will over that of the voting minority. Two, many of these progressive public commentators threaten us with the far-right who might rise, and indeed, who are most probably already rising. For example, Trump’s discourse is not much different from various European far-right leaders like Wilders or Le Pen. But what is often omitted is the genealogy of this rise. This is not a natural occurring phenomenon: it was constructed by decades of elitism, ideological contradictions and increasing inequalities. Who is afraid of representative ‘democracy’? Nevertheless, it is not only certain liberal journalists who bemoan a malfunctioning democracy. Lately, they are joined by many European politicians. Since 1972, 66 referendums have been organised in the EC/EU and EEA area. Four of the most recent ones were in fact on EU participation and policies and have taken place within only the last two years. In all these cases, the EU elites of Brussels more or less blackmailed European citizens into voting the way they wanted and punished them when they refused. One problem though seems to be that people often vote for or against something – even if this decision is against their own interests – simply because the hated political and media elites advise them to act differently. In Hungary, on 24 February 2016, the right-wing coalition Fidesz-KDNP leader Victor Orbán called for a referendum on whether or not the country would accept the refugee quotas dictated by the EU. Orbán argued that the 1,294 refugees from Greece and Italy that his country was supposed to receive, would “redraw Hungary’s and Europe’s ethnic, cultural and religious identity, which no EU organ has the right to do”. The referendum took place on 2 October 2016 with the Hungarian public refusing the country’s participation in the EU Asylum Relocation Program with the unprecedented 98.36%. However, due to the participation rate being below 50% the referendum was deemed invalid. Nevertheless, only a month before the referendum Luxemburg’s Foreign Minister Jean Asselborn had called for the expulsion of Hungary from the EU due to the country’s lack of respect for European values in raising walls against refugees. Asselborn sent a message to the Hungarian people to proceed carefully to the voting stations. He certainly did not send a similar message to Austria that is currently building a fence across the Austrian-Italian border. After the referendum results were published, Brussels bureaucrats celebrated its failure due to the low turnout. The most discussed referendum in the history of the EU has been the one that took place on 23 June 2016 in the UK. In this referendum the British voted for their country to leave the EU by a majority of 51.89%. This result brought a domino effect with one after the other European political leaders proposing that the same type of referendum should take place in their own countries. After Brexit, the leadership of both the Tory and the Labour party have proposed a form of new deal whereby Britain would not entirely leave the Union: at which the President of the European Commission, Jean-Claude Juncker, promptly responded that not only was a new deal not possible but that Brexit presented an opportunity for deeper European integration. Additionally the Council of Europe said that the referendum was not valid because the voters were not given a two week period to make up their minds. The limits of a representative democracy? According to social theory events are catalytic, but they are only representing ongoing social transformations. These four incidents manifest that representative democracy in Europe is reaching its limits. When socialism collapsed in 1989-90, the spread of the multi-party representative system all over Europe came promising democracy. Twenty years later, in 2011 protesters in Spain, Greece and elsewhere revolted under a central slogan ‘Real Democracy’ . They were proposing alternative, horizontal and non-representative forms of democratic decision-making. But most importantly, the protests were bearing witness to the fact that the current economic and political system is far from democratic. After all, when a system calls itself democracy, but forces increasing swathes of the demos (people) to live under poverty, its own central concept gradually becomes hollow. This hollowness manifests itself, more clearly than ever before, during the Euro-crisis. It remains to be seen how and what will replace the current representative system that we are witnessing decompose in front of our eyes. Meanwhile, history has a lesson for us, Nazis and fascist governments in Europe emerged within systems of representative democracy under free market capitalism, similar to the ones we have today. However, there is another striking resemblance: before the far-right parties took power in interbellum Europe, it was the democratic state apparatuses who first devalued their own polities.